Product Details - Ingredients - hardened yak milk called churpi, include Cow milk, Yak Milk, Salt and Lime, Contain no preservatives or binding agents. Nutritional Fact - Crude Protein- Min 59.2%, Crude Fat- Min 5.2%, Moisture -Max 10 %, Fiber - Max 5.9%, Suitable- puppies who enjoy biting on treats for long hours. Use- Rich in Calcium and Vitamin D, Enhances bone growth and muscle strengthening. 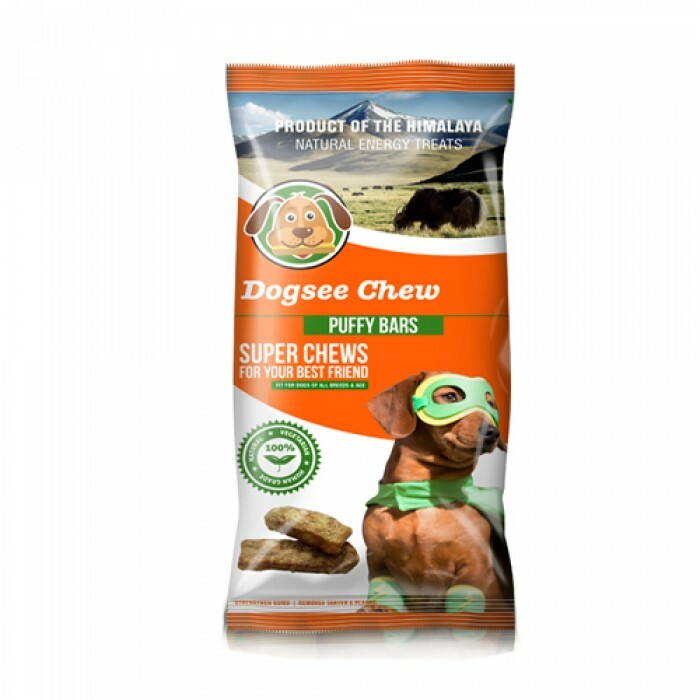 Product Information - Dogsee Chew puffy bars are manufactured specially for dogs that enjoy the soft and crunchy taste of our treats and love to nibble down any treat given to them. This popcorn treat for dogs is a perfect snack for curbing those midday hunger pangs of your furry friend. These are good for dogs of all sizes and ages especially smaller dogs and puppies. The treats are rich in protein and low on fat content. The recipe for Dogsee Chew treats was born out of an ancient recipe for hardened yak milk called churpi.Dogsee chew Puffy bars are the perfect treat for your dog no matter what the occasion maybe. These Crunchy Dogsee Chew Puffy bars are the longer form of Dogsee Chew Puffies. They are prepared for your pup to enjoy the taste of Dogsee Chew bars for a longer amount of time. 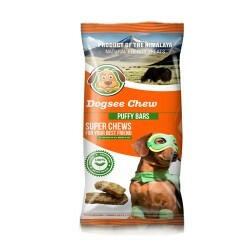 Give your dog a healthy and organic diet, full of rich rare minerals with Dogsee chews Puffy bars.Benefits - Dogsee Chews treats are manufactured from natural ingredients. These nutritious bars make your mutt more healthy and strong.100% Gluten-free. It has high protein content and less carbs. The fat content is less than 1% of the whole product. Easy to digest.